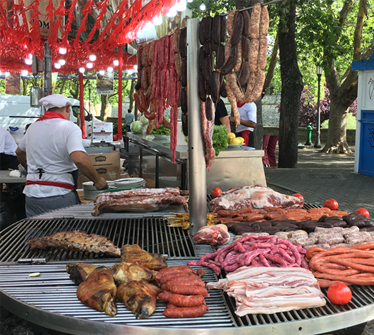 Join Kathleen on any or all of these custom weekend excursions on the Iberian Peninsula. Each weekend trip has been carefully planned to provide the most authentic cultural and linguistic experiences possible. The small group experience allows you time to explore on your own as well group activities. You will visit and experience locales that are not experienced by most tours. Accommodations have been carefully selected to provide the utmost comfort at a reasonable price. Feel free to invite friends and family to join us on these great trips. 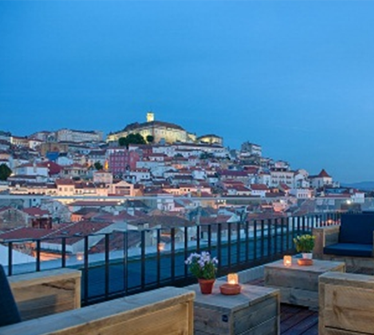 Friday: Leave Salamanca in the morning and travel by bus to Coimbra. Check in at the hotel and spend the afternoon touring the city with the oldest university in Portugal. In the evening: our group will enjoy a traditional Portuguese Cena at La Diligencia and hear authentic Fado music performed by local artists. Saturday: Breakfast at hotel and depart for Porto. 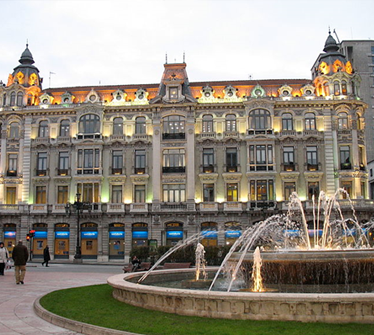 Check in at the hotel and have the afternoon and evening free to explore the beautiful city. A Yellow bus pass is included for your ease and comfort. Visit the bodegas, harbor, museums, and beaches. Sunday: Breakfast in Oporto. Spend the morning finishing up your Porto adventures. 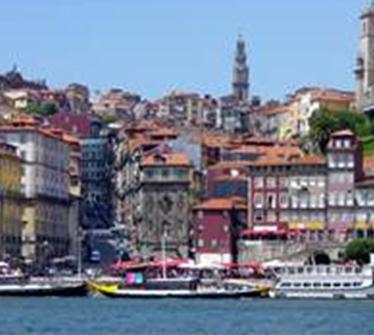 After lunch, we leave Porto for Aveiro, a port city known for its stylish Art Nouveau buildings and canals. 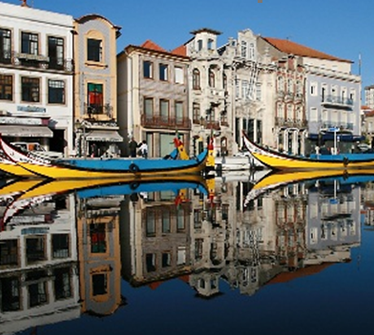 Spend 2 -3 horas en Aveiro, a scenic boat tour is included in the package. Depart Aveiro around 5:00 PM and arrive in Salamanca around 7:00 PM. 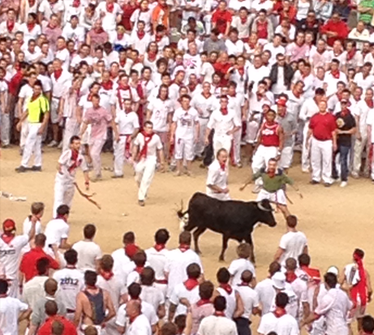 Friday: Leave Salamanca in the early afternoon and travel by bus to Pamplona. The scenic trip will take us through diverse regions of Spain, with two stops along the way for your comfort. Check in at the residence and change into your fiesta clothes. At 10:30 P.M. our guide will take us to the most spectacular fireworks display! After the fireworks, you will have the opportunity to enjoy the many open-air concerts, markets, and dining that remain open throughout the night. You may retire whenever you like, as your residence is located in the center of town. Saturday: At 6:00 A.M. we will walk with our guide to the Plaza de Toros where we will view the most spectacular event of the Sanfermines: The Encierro or Running of the Bulls. At 10:00 A.M. we will situate ourselves to witness the great Procession of the Patron Saint. 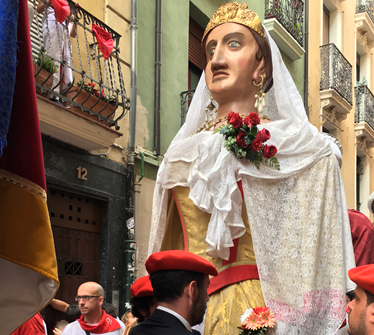 Since this is the first day of the festival and the actual Feast Day of San Fermín, we are fortunate to be here to witness the procession wind through the streets. After the procession, you may take a tour of the city guided by Don Vicente. Saturday afternoon you will be free to explore, enjoy the music, rest or just enjoy the festive atmosphere of the city during the fiesta. At 5:00 P.M. you may attend the bullfight if you have purchased a ticket or you can continue to enjoy festivities outside the Plaza de Toros. At 10:30 P.M. you will again witness the spectacular fireworks display. This night they will be even grander, as they escalate in magnitude each night of the 7day fiesta. You will again participate in the grandiose musical and cultural events that last throughout the night. You can turn in whenever you like as your clean, comfortable bed awaits you in the residence. At 6:00 A.M. you may choose to walk again with our guide to the Plaza de Toros where you will view the daily Encierro or Running of the Bulls, or perhaps you will elect to sleep in. At 11:00 A.M. we will depart for Salamanca on the coach bus. En route, we will stop for an hour and you may elect to buy lunch or a snack. We will arrive in Salamanca around 5:00 P.M. You will be dropped at one of the two stops where you joined the tour on Friday. Breakfast in hotel Sat. and Sun. Group travel to and from the organized points of interest over the 3 day weekend. A few meters from the hotel you can enjoy an unforgettable visit to the famous Tito Bustillo Caves and its Museum. One of the few caves in which you can see prehistoric paintings of unique quality in the world. The cave of Tito Bustillo preserves twelve sets of rock art distributed throughout the cavity. The rich variety of these manifestations, with paintings and engravings of signs, animals and anthropomorphic representations, make the cave of Tito Bustillo is considered one of the best examples of Paleolithic rock art of Asturias and one of the most complete sites on the entire Corniche Cantabrian. Depart for Cangas de Onis and Los Picos de Europa: The Santa Cueva de Covadonga is a Catholic sanctuary located in Asturias, northern Spain. It is a cave in the Picos de Europa mountains, which gives its name to the parish of Covadonga in the municipality of Cangas de Onís. The Picos de Europa Natural Park, which occupies a large area of the Cantabrian Mountains, is the oldest natural park in Spain (close to 100 years old). 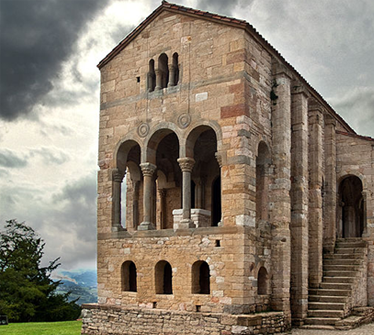 It extends through the provinces of Asturias, Cantabria, and Castilla León. It is a high mountain park of karstic geology with an altitude that varies from 75 meters to more than 2600 meters above the surface of the sea. The faunal wealth of the National Park can be described as exceptional because it represents all the Cantabrian fauna. Breakfast in the hotel, load suitcases on the bus. 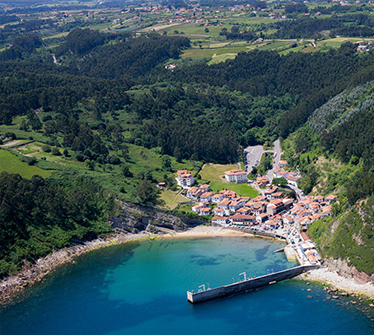 Depart for the coastal towns of Llanes and Ribadesella to enjoy the beaches and quaint village life. Sunday can be a day of wáter sports and activities or simply enjoying the beauty of coastal village life, your choice. 4:00 PM. Board bus for return trip to Salamanca.